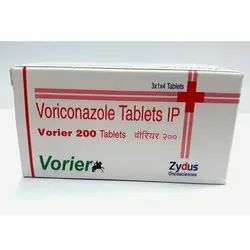 Our product range includes a wide range of vorier tablet. Vorier 200 MG Tablet is used to treat a variety of fungal infections of the lungs, mouth, and throat. Take this medicine at least 1 hour before or after food. Do not take this medicine if you have a known allergy to it. Looking for Anti Fungal Medicines ?